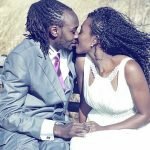 Alex Mwangi alias MC Alemba, and wife, Mweru Waithuki, welcome their second born into the world. This is just days after announcing that the wife is expectant. Fans flocked social media sharing congratulatory messages to the MC and family, wishing them many more blessings in their tomorrow. The post It´s a baby boy: Popular Kenyan MC and wife welcome a bouncing baby boy appeared first on Ghafla! Kenya.